Every year when the leaves begin to change colors, the air gets crisp, and pumpkin spice makes its debut, we gather together to party in honor of Guatemalan students. Because, really…how better to honor little party animals like Jose (below) than by throwing a party to support their education!? 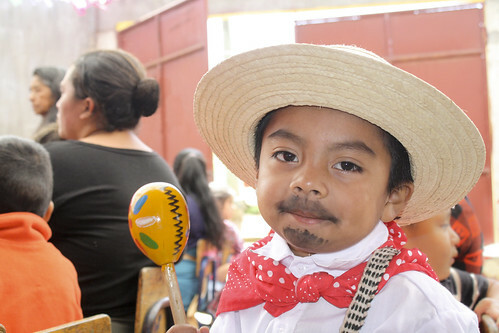 Each Fall Fiesta is a little bit different, and many guests reported that this year’s event was the best one yet! 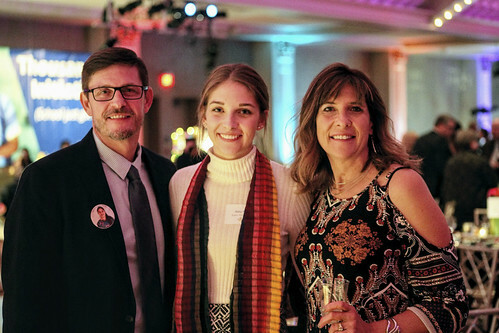 Read on for the top five highlights of Fall Fiesta 2018, including how much money you raised for Guatemalan students! 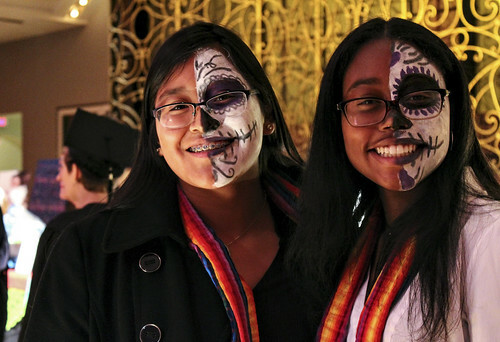 This year’s Fall Fiesta had a Day of the Dead theme, and everyone was getting into it! 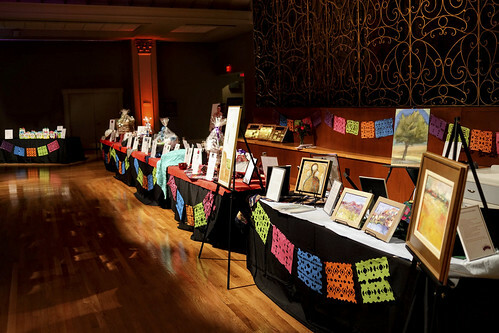 The tables and bar were decked out in papel picado (cut paper). 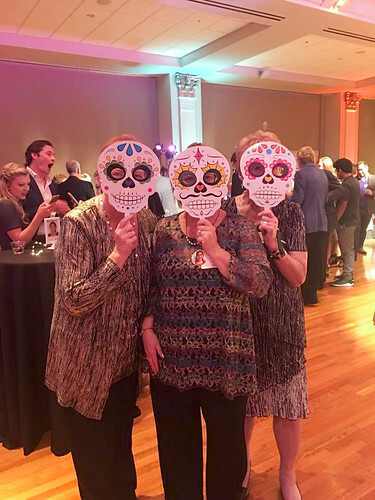 The guests and volunteers masqueraded as calaveras (skulls). 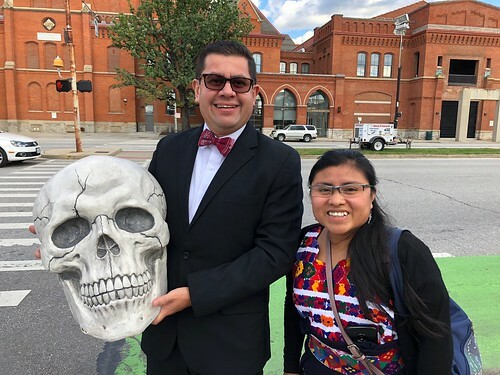 And CoEd’s General Director of Guatemala Operations—Rony Mejía—brought a new, lively friend to the event. Papel picado (cut paper) decked the tables and bar. And Rony (CoEd’s General Director for Guatemala Operations) brought a new, lively friend. 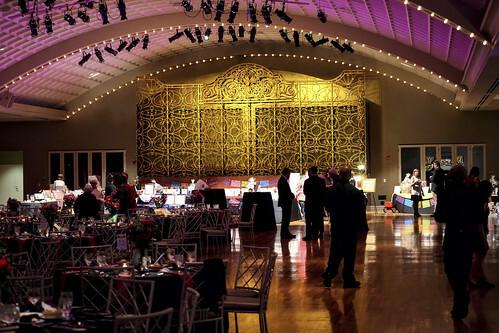 For the first time ever, Fall Fiesta was held in Cincinnati’s historic Music Hall—named as a National Historic Landmark thanks to its distinctive Venetian Gothic architecture. Fitting the Day of the Dead theme, Music Hall is reputed to be one of the most haunted places in America. (Luckily, we didn’t need to call the Ghostbusters.) All we know is: It was beautiful! Music Hall is also rumored to be haunted—luckily no ghosts invaded the beautiful ballroom while we were there! Special guest Sandra Capen traveled from Guatemala to share her story with everyone in person. Sandra graduated from the Rise Youth Development Program (formerly the Scholarship & Youth Development Program) and she believes so strongly in it that she came back to be on its staff! Sandra credits the Rise Program with not only helping her to break out of poverty, but also helping her to change her entire family dynamic for the better. Our special guest, Sandra (left) came to speak about how the Rise Program has changed her life. 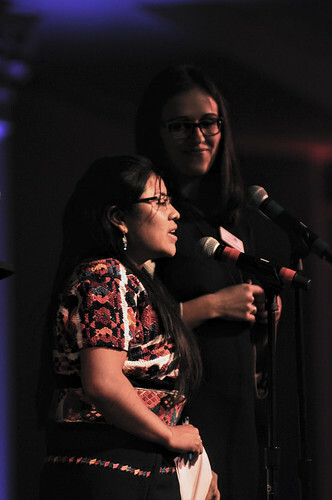 Before her speech, Sandra was introduced by her former Rise sponsor, Maggie (center). We all know that what really makes a party are the PEOPLE—and this year was no exception! We had a blast greeting old friends and making new ones as we dined, drank, and bid on fabulous prizes like wine, art, sports and theater tickets, exclusive experiences, and an array of vacation packages! What always makes Fall Fiesta so special is sharing it with you! Your generosity poured forth all night long, raising an outstanding total of $186,000! What can that amount of money do in Guatemala? A LOT. 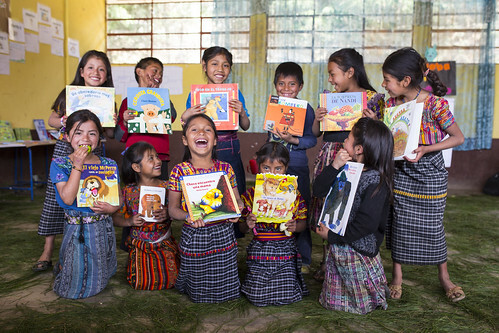 Your generosity will ensure that next year, thousands of children learn to read, thousands more learn critical thinking and technology skills, and a new generation is empowered to break the cycle of poverty forever through the Rise Program. …and a new generation break the cycle of poverty forever through the Rise Program! So all we’ve got to say is party on, friends. Party on. Thank you, Karen! We were so floored by your generosity. *YOU* are changing these kids’ lives! What a marvelous celebration! Wish we could have been there. Congratulations on the funds raised to further your wonderful work in Guatemala. Thank you so much, Linda! We missed you and Bob and the grandkids, but loved seeing Kate! Hopefully we’ll meet again soon. Auction site wouldn’t accept our Visa card for payment so we could not participate in the auction. Do you suppose you will resolve this for next year? Donna, we were so sorry to hear that. We will do all we can to fix this issue for next year. Is there anything else we can do to help rectify the situation? What a wonderful party and I’m so happy to hear that $186,000 was raised!!! CoEd can continue to break the cycle of poverty through education!!! Thanks, Lois! 🙂 We were so happy you were there! Thanks very much for the report. We are so sorry that we were not able to make it. I was looking forward to walking in the door and seeing if anyone recognized us. We got as far as Denver, but the flights were full to Cincinnati, so returned to Aspen. Hopefully, next year. Our best to all the gang. We would have recognized you in an instant, John! We were so sorry the surprise didn’t pan out, but trust us, the shock and delight were still there! We also can’t wait to meet Suzanne. All of the best to you both. Bravo! What an incredible total! Thanks, Jenn! We missed you! With your team you can work miracles! We couldn’t do it without you, Charlotte! It was my first time coming. I had a great time with my friends Casey and TAK. Super excited to hear how much was raised. We were so happy to have you there, Pat! Hope to see you again! Your generosity makes such a difference in the lives of these kids. We were sorry to be out of town for this year’s event. We heard it was amazing and indeed the photos show that to be true! Thankful for such a fabulous result and looking forward to great things for our precious students, families, and their communities. Congrats to you all! What an awesome event!! 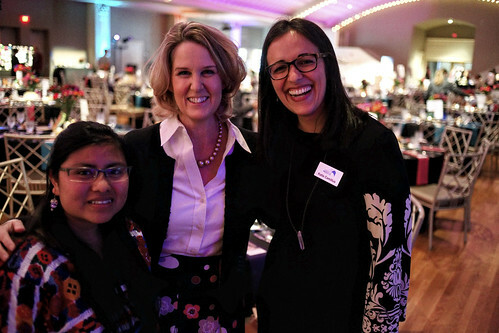 Thanks for all you do for the kids and families of Guatemala…. Thank you, Hanna’s! It wouldn’t have been the same without you, and neither would the lives of many students in Guatemala!